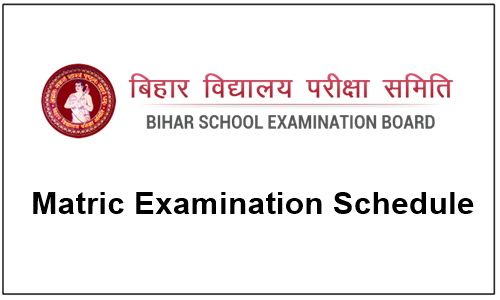 Bihar Board 10th Time Table 2019: The Bihar School Examination Board (BSEB) has released Bihar Matric/10th Examination Schedule 2019 at biharboardonline.bihar.gov.in. All the candidates who are studying 10th are get ready to write exams from February 21 to February 28. Students in Bihar will appear for the matric/10th board examination can download the Bihar 10th time table in the PDF format from the Bihar exam board official website. 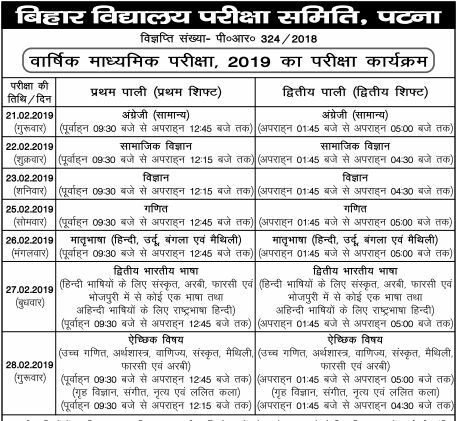 Bihar Board Matric Examinations will begin on 21st February 2019 (Thursday) with English as the first paper in first shift (9.30 am to 12.45 pm). The second shift will be held from 2 pm to 5.15 pm. BSEB class 10 exams will continue till 28th February, 2019 (Thursday). As every year students are awaited for the exams to score for the good marks as they initial career begins with the 10th/Matric examinations. They are several government jobs which is related with the secondary school examination results. last year also many of them secured best results . Many of them choose the higher studies and the remaining are interested in jobs. Get start prepared from today itself to get the best results. Last year, a total of 15.47 lakh students appeared for the class 10 exams out of which 8.21 lakh students failed. The class 10 board examination will begin on February 21 and conclude on February 28, 2019 while the intermediate exam will be conducted between February 6 and 16, 2019. The examination will be conducted in two shifts. First sitting exam will be conducted between 9:30 am and 12:45 pm while the second sitting will be held between 1:45 pm and 5 pm. The first 15 minutes time will be provided to read the question paper and the duration of exam will be 3 hours. Bihar Board Class 10th exam dates, shifts and subjects. Go to the official website:”http://biharboardonline.bihar.gov.in”. Save it on your pc for futher use. Speaking about the exam schedule, the Board’s chairman, Anand Kishore, said that the calendar has been released to give sufficient time for students to prepare for the exams.